Researchers identify previously unknown protein in immune cells. B lymphocytes, also known as B cells, are the only cells to produce antibodies, which the immune system needs to fight off foreign intruders like pathogens in order to protect the human body. On their surface, B cells carry B cell receptors which activate the B cells when an antigen, a substance on the surface of a pathogenic germ, binds to them. B cells remain an active area of research as they play a critical role in the immune system, and are implicated in several disease states, including cancer. Understanding the basis of B-cell function and dysfunction is also of interest for the development of new vaccines and therapies. Now, a study from researchers at the University of Freiburg has identified a new protein, Kidins220/ARMS, in B cells which is observed as playing a decisive role in the production of antibodies and the formation of B cells. The team state that this knowledge could help to develop new medications for autoimmune diseases or other illnesses in the future. The study is published in the Journal of Experimental Medicine. Previous studies show that Kidins220/ARMS is present in nerve cells and in T cells of the immune system. It is a membrane protein that is preferentially expressed in the nervous system and interacts with the microtubule and actin cytoskeleton. It interacts with neurotrophin, ephrin, vascular endothelial growth factor (VEGF) and glutamate receptors, and is a common downstream target of several trophic stimuli. Kidins220/ARMS is required for neuronal differentiation and survival, and its expression levels modulate synaptic plasticity. Kidins220/ARMS knockout mice show developmental defects mainly in the nervous and cardiovascular systems, suggesting a crucial role for this protein in modulating the cross talk between different signalling pathways. The current study is first to show that it is present in B cells. The current study shows that Kidins220/ARMS interacts with the B cell receptor and affects signalling pathways from the receptor to the interior of the cell. Results show that without Kidins220/ARMS, the receptor’s ability to send signals is limited with B cells manufacturing less antibodies and the immune system weakened. Data findings show that Kidins220/ARMS is also vital for the formation of B cells. The group observed that if a mouse cannot produce this protein, the B lymphocytes develop in a way that makes them less functional than the B cells of a healthy immune system. The researchers state that the reason for this is that B cells depend on the signals from the B cell receptor and pre-B cell receptor, which is the early version of a B cell receptor, at various stages of their development. The team surmise that their findings show that deficiency in Kidins220/ARMS obstructs the development of B cells and indicates that Kidins220 positively regulates pre-BCR and BCR functioning. This is artwork painted by the daughter of researcher Susana Minguet. 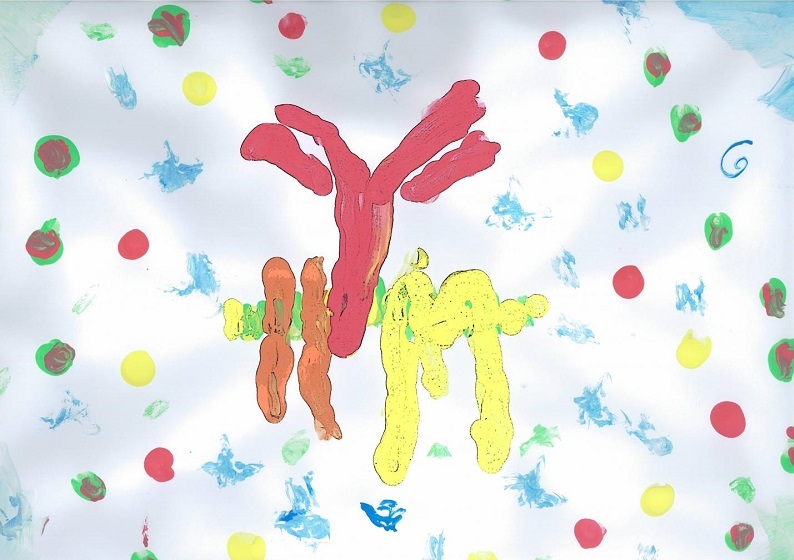 The protein Kidins220 (yellow) interacts with the B cell receptor (red and orange). Credit: Susana Minguet.